32. 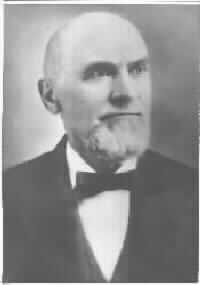 Charles Abram5 STUCK (Benjamin6 STOCK, Joh: Michael7, Johan Melchior8, Johann Melchior9, Matthaus10)(56) was born near Elizabethtown, Lancaster Co., PA, December 29, 1832. (57) He died of apoplexy at about 9:00 a.m. August 26, 1898 in Jonesboro, Craighead Co., AR, at 65 years of age. His body was interred in City Cemetery, in Jonesboro, Craighead Co., AR. He married Margaret Ann McCULLOUGH near Morocco, Newton County, IN, May 15, 1862. She was born in Liberty, Union County, IN November 30, 1837. Margaret Ann(58) was the daughter of Samuel McCULLOUGH and Mary LONG. She died April 5, 1925 at 6:00 p.m. of the infirmities of old age in Jonesboro, Craighead Co., AR, at 87 years of age. Her body was interred in Jonesboro, Craighead Co., AR, City Cemetery. Charles organized and managed C. A. Stuck & Sons (the family planing mill and lumber dealership he had started in Watseka, IL) in Jonesboro, Craighead Co., AR, until his death. For some more specifics of his interesting life, please see this item by item chronology. + 12 i. Will [R]4 STUCK was born June 28, 1872. 33 ii. Flora STUCK(59) was born in Watseka, Iroquois County, IL, March 14, 1864. She died 6:30 p.m. June 8, 1942 in Jonesboro, Craighead Co., AR, at 78 years of age. Her body was interred in Jonesboro, Craighead Co., AR, City Cemetery. She took an active part in the affairs of the family lumber business in Jonesboro, Craighead Co., AR for a number of years, then managed her Real Estate investments until her death. 34 iii. Elmer Charles STUCK(60) was born in Watseka, Iroquois County, IL, August 26, 1866. He died October 24, 1937 in Jonesboro, Craighead Co., AR, at 71 years of age. His body was interred in Jonesboro, Craighead Co., AR, Oak Lawn Cemetery. He married twice. He married Bessie AXTELL in Danville, Vermilion Co., IL, October 7, 1891. She died December 1904 in Jonesboro, Craighead Co., AR, at 36 years of age. Her body was interred in Danville, Vermilion Co., IL. He married Branch PETERSON in Jonesboro, Craighead Co., AR, September 3, 1908. She was born August 27, 1876. She died June 3, 1954 in Jonesboro, Craighead Co., AR, at 77 years of age. Her body was interred in Jonesboro, Craighead Co., AR, Oak Lawn Cemetery. E. C. was first associated with his brother, Will, in the family lumber business. They subsequently divided their interests and he became owner and manager of the Jonesboro Brick Co. in Jonesboro, Craighead Co., AR, until his death. 35 iv. Sammie STUCK(61) was born in Watseka, Iroquois County, IL, October 21, 1869. Sammie died 4:00 p.m. October 6, 1870 in Watseka, Iroquois County, IL, at less than one year of age. His body was interred in Watseka, Iroquois County, IL. 36 v. Lucius Tarlton STUCK(62) was born in Watseka, Iroquois County, IL, February 19, 1875. Tarltie died 10:00 p.m. October 1, 1878 in Watseka, Iroquois County, IL, at 3 years of age. His body was interred in Watseka, Iroquois County, IL. 37 vi. Maggie Lena STUCK(63) was born in Watseka, Iroquois County, IL, September 26, 1877. Maggie died 11:00 a.m. October 12, 1899 in Jonesboro, Craighead Co., AR, at 22 years of age. Her body was interred in Jonesboro, Craighead Co., AR, City Cemetery. She married Henry M. COOLEY in Jonesboro, Craighead Co., AR, November 2, 1898. He was born August 10, 1871. He died January 12, 1959 in Jonesboro, Craighead Co., AR, at 87 years of age. His body was interred in City Cemetery, Jonesboro, Craighead County, AR. The Stuck family records and the newspaper obituary show her name as Maggie Lena. Her tombstone, most likely supplied by her husband, gives her name as Marguerite.